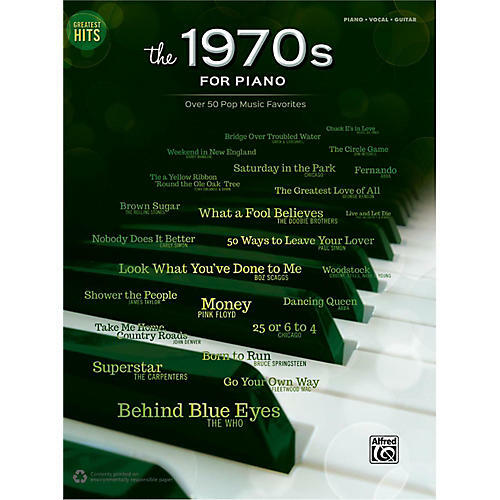 This collection of over 50 songs highlights the best songs from the '70s, by such artists as Fleetwood Mac, Simon and Garfunkel, James Taylor, Pink Floyd, CSNY, Joni Mitchell, The Doobie Brothers, and more. Piano accompaniment, vocal melodies, lyrics, and guitar chord diagrams are included. Titles: 25 or 6 to 4 (Chicago) * 50 Ways to Leave Your Lover (Paul Simon) * Afternoon Delight (The Starland Vocal Band) * Behind Blue Eyes (The Who) * Blinded by the Light (Manfred Mann Earth Band) * Born to Run (Bruce Springsteen) * Bridge Over Troubled Water (Simon and Garfunkel) * Brown Sugar (The Rolling Stones) * Celebrate Me Home (Kenny Loggins) * Cheeseburger in Paradise (Jimmy Buffett) * Chuck E's in Love (Rickie Lee Jones) * The Circle Game (Joni Mitchell) * Dancing in the Moonlight (King Harvest) * Dancing Queen (ABBA) * Disco Inferno (The Tramps) * Do You Feel Like We Do (Peter Frampton) * Does Anybody Really Know What Time It Is (Chicago) * Don't It Make My Brown Eyes Blue (Richard Leigh) * Europa (Earth's Cry, Heaven's Smile) (Santana) * Evergreen (Love Theme from A Star Is Born) (Paul Williams and Barbra Streisand) * Fernando (ABBA) * Georgy Porgy (Toto) * Go Your Own Way (Fleetwood Mac) * Gonna Fly Now (from Rocky) * The Greatest Love of All (George Benson) * Handy Man (James Taylor) * Help Me (Joni Mitchell) * Hold the Line (Toto) * Hold Your Head Up (Argent) * I Believe in Love (Kenny Loggins) * If You Leave Me Now (Chicago) * Knock Three Times (Tony Orlando and Dawn) * The Letter * Live and Let Die (Paul McCartney and Wings) * Look What You've Done to Me (Boz Skaggs) * A Love Song (Loggins and Messina) * Lowdown (Boz Skaggs) * Mamma Mia (ABBA) * Money (Pink Floyd) * Theme from New York * Nobody Does It Better (Carly Simon) * Play That Funky Music (Wild Cherry) * Rosalita (Bruce Springsteen) * Saturday in the Park (Chicago) * Short People (Randy Newman) * Shower the People (James Taylor) * Stairway to Heaven (Led Zeppelin) * Sunshine on My Shoulders (John Denver) * Superstar (The Carpenters) * Take Me Home, Country Roads (John Denver) * Theme from Ice Castles (Through the Eyes of Love) * This Masquerade (George Benson) * Thunder Road (Bruce Springsteen) * Tie a Yellow Ribbon Round the Ole Oak Tree (Tony Orlando and Dawn) * Treat Her Like a Lady (Cornelius Brothers and Sister Rose) * Weekend in New England (Barry Manilow) * What a Fool Believes (The Doobie Brothers) * Whenever I Call You "Friend" (Kenny Loggins) * Woodstock (Crosby, Stills, Nash and Young) * Your Smiling Face (James Taylor).